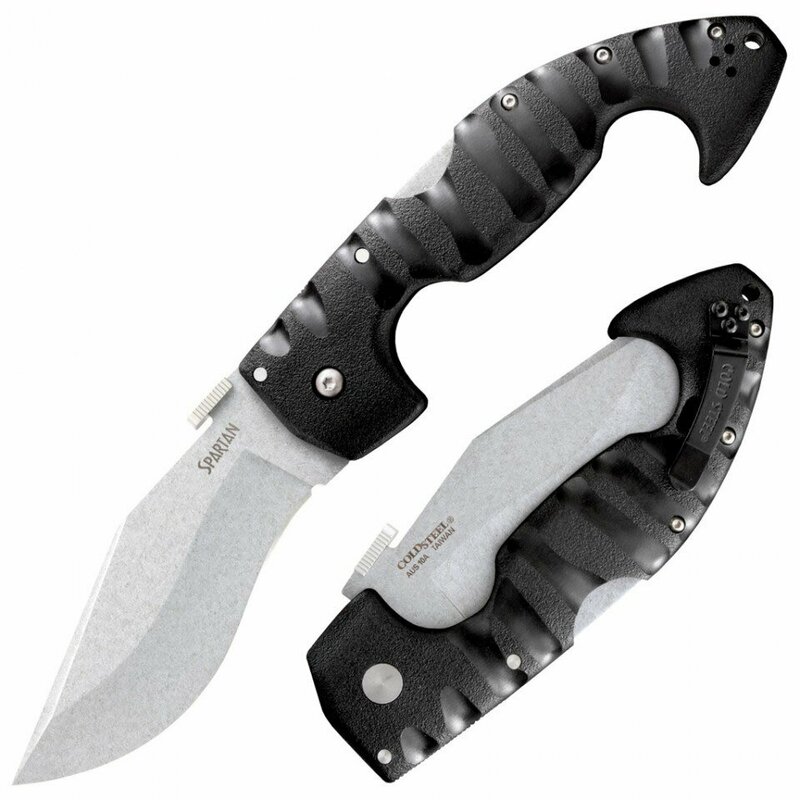 Knife Cold Steel Spartan (Folding Kopis) AUS 10A(21ST) High quality Cold Steel knives, throwing knives, tactical knives. The word Spartan conjures up the vivid history of the battle of Thermopylae, a story of enormous courage in the face of devastating odds. The Spartans were a tough breed, trained from childhood in the art of war and inured to most privations, both mental and physical. Engaging them at close quarters was something to be feared and avoided, as their famous Kopis swords struck off arms and legs like a scythe in a wheat field! Designed by Andrew Demko, the Cold Steel Spartan™ is a folding Kopis scaled down to accommodate the demands of a tamer, more sophisticated world. The 4" blade evokes the classic Kopis of the ancients with its characteristic recurved edge, big belly and sharp, acute point. Blade made of AUS 10A steel and has some similarities with a Kukri. Like the Kukri, the Spartan™ always presents its edge at an angle to the material being cut to produce a deep sheering effect. However, since its point is narrower and more acute than most Kukri blades, it stabs almost as well as it cuts. The Spartan™ also echoes the ancient Kopis in its handle. It's designed to help the hand resist the pull of centrifugal force and to retard forward momentum, when stabbing, or backward movement, when hammering or smashing with its pommel. Injection molded out of Griv-Ex with steel liners for strength, it's heavily contoured for comfort and features irregular fluting and a heavily textured surface finish for an exceptionally effective grip.